If you are a member of Social Security System or simply SSS, it is very important to register at My.SSS in order for you to access and check your social security records without leaving your home. 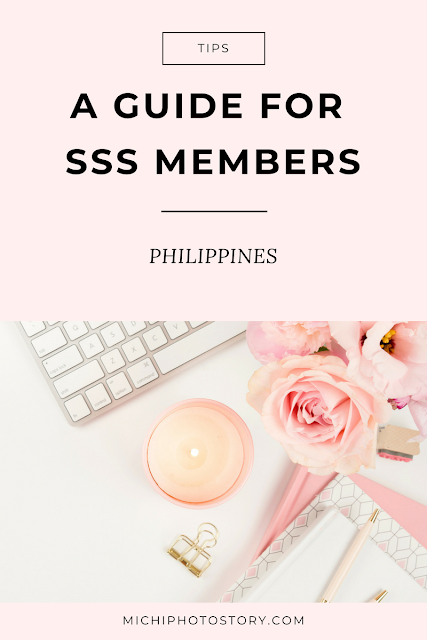 You can use a computer, laptop, tablet or even smartphone with an internet connection to access the SSS website. Once you have the SSS online account, you can now view or update your membership records, you can check your contributions and you can apply for SSS loan and benefits. There are more things that you can do using the My.SSS account at the comfort of your home. I created my SSS online account a decade ago so I’m not sure if the process is still the same. But one thing for sure, it is easy to create an account as long as you follow the steps. 3. Select one information, as reported to SSS to register. 4. Fill-out the form, enter the verification code, check the I accept the Terms of Service and click submit. 5. Check your email and click the link from SSS to complete your registration. 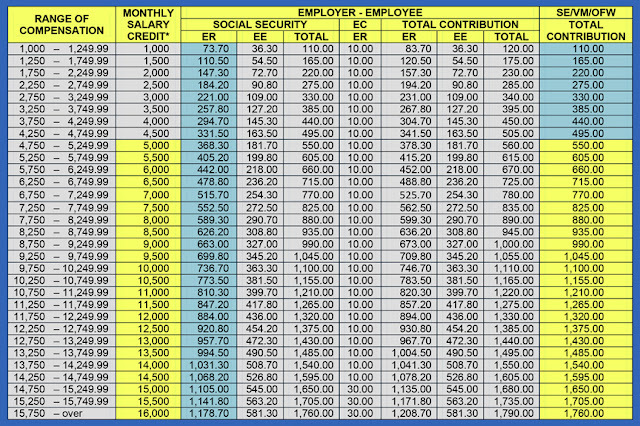 Last December 23, 2013, I received an email from SSS stating the increase of contribution rate starting January 2014. “Dear Self-Employed, Voluntary and OFW Members: Effective January 2014, the Social Security System (SSS) will implement a 0.6-percent increase in its current 10.4-percent monthly contribution rate, thereby setting the new contribution rate at eleven (11) percent. At the same time, the maximum Monthly Salary Credit (MSC) will be increased from P15,000 to P16,000. As affirmed by SSC Resolution No. 711-s.2013 dated 20 September 2013, the new SSS contribution rate and the new maximum MSC will become effective for the applicable month of January 2014." 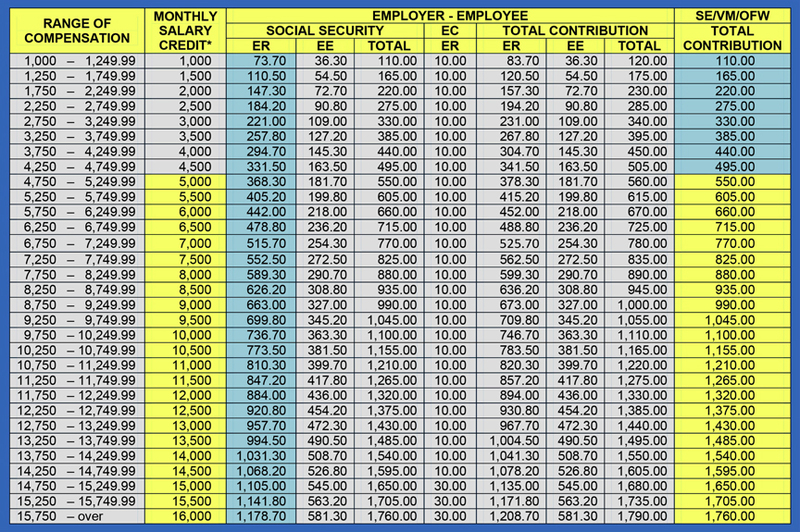 Here is the SSS CONTRIBUTION SCHEDULE. I'm a voluntary member so I always pay my contribution at SM Payment Center. I choose quarterly payment so I don't have to go every month. Nowadays, once you pay your SSS contribution, you may receive text confirmation that your payment has been posted, but it may take weeks after the payment. From time to time, I also check my contribution online, I copy/paste or screenshot it so I have a copy of all my contributions. 4. Click Member’s Information and Actual Premiums. Then you will see all your contributions and the total of the contributions that you have paid. From the time you started working, you are already paying your SSS contributions but do you know how much is your pension by the time you retire. Don’t worry, it is so easy to check your retirement benefits online. * Assuming continuous payment starting on the month after the date of inquiry up to the 60th and 65th birthday or until qualified for the pension. * The computed amount of retirement is just an estimate and may differ from the actual amount of your retirement benefits. So if you want to increase your pension amount, increase also your contributions and don’t forget this condition. * SE/Voluntary/OFW/NWS who is below 55 years old shall be allowed to change his/her Monthly SSS contributions without limit in frequency and in number of salary brackets in a given year, but in no case shall be lower than the prevailing minimum monthly contribution for SE/Voluntary/OFW/NWS members. Note: The monthly pension depends on the member’s paid contributions, credited years of service, and the number of his dependent minor children that must not exceed five. The monthly pension will be the highest amount resulting from either one of the three pension formulae. 1. The sum of P300 plus 20% percent of the average monthly salary credit plus two percent of the average monthly salary credit for each credited year of service in excess of ten years. 3. P1200, if the credited year of service is at least 10 but less than 20; or P2400 if the CYS is 20 or more. I applied for SSS Salary Loan and according to the email that I’ve received my first payment would be on October 2012 so I’ve made my first payment at SM Payment Center. The only disadvantage of a voluntary member is I have to pay every month at the payment center unlike the employed members, HR is responsible for that. 1. Go to SSS branch or SM payment Center. I always go to SM because it is open every day. 2. SM payment center provides form but if you want you can also print the form from SSS website. 3. Fill it out and make payment. I always pay my SSS contribution at SM Payment Center but during the first quarter of 2018, SM stopped accepting SSS payment because they need to update their system. So I started paying my contribution at SSS office. Minsan wala pila pero madalas mahaba pila, the longest that I stayed is 2 hours and 30 minutes. Waah! I hope I can pay na sa SM Payment Center. Last year, my friend told me that SSS is now requiring Payment Reference Number or PRN, yun na daw ang need at hindi na SSS ID number para magbayad. I just need to login at my SSS account to get the PRN. It started last September 6, 2018 but since matagal pa December, deadma muna ko. I failed to pay my October to December 2018 contribution last December, good thing that my due date is January 31, 2019. So after the holiday, I checked my email and looked for the email that SSS sent me last September. I watched the Step by Step Guide for Real-Time Processing of Contributions (RTPC). SSS will send your PRN to your registered mobile number and email address or get your PRN through email PRNHelpLine@sss.go.ph, SSS Call Center 920-6446 and 917-777, e-Centers in SSS branches, SSS Tellering Counters, and MY.SSS. You may also view and edit your Statement of Account (SOA) and change your payment period and contribution amount. Since April, I haven’t received any text regarding my PRN number so I just get my PRN online. Just go to My.SSS website. After I paid my contribution, I did not check if real-time nga yung posting but the following day, I received text from SSS regarding my contribution payment. I also received the PRN number for January to March 2019 contribution. I checked my account after one week and my payment was already posted. Unlike dati, parang buwan pa bago mapost so happy ko sa improvement na ito. At least real time na ang posting. While waiting at the SSS, I heard na may expiration daw yung PRN, dapat within 5 days pagkaprint mo, nabayarang mo daw.